The origins of the guitar are beyond the scope of this article, but it is fair to say that by the time the Spanish opened the first music conservatories in the mid-1500s in their vice-realm of Naples, the guitar—recognizable as such even to modern eyes—was already in existence. Generally, the instrument was "four-course." A "course" is a tuning; thus, "four-course" might mean four strings, tuned separately, but it might also mean eight strings, with each pair of strings doubling a note. Illustrations from the mid-1500s show guitars to have the familiar central sound hole encircled by the ornamental "rose," the lute-type bridge and frets, and a rounded, ribbed back. The "bouts"—the curves that give the "hour glass" shape to a modern guitar (illustration, right)—were, however, much less pronounced. The four-course guitar was replaced by the five-course instrument—very popular for the sophisticated dance and instrumental music of the Baroque—and then by the modern six-course guitar, in common use by the year 1800. Single strings came to be preferred, as well, for various musical reasons such as clarity of sound, and technical reasons such as ease of plucking. Also, by the late 1700s older tablature notation* was superseded by modern staff notation for the guitar. The change to single-strings as well as the change in notation facilitated polyphonic part-writing and presaged the future of the guitar as a solo instrument. ...although I use the guitar of seven single strings, it seemed more appropriate to accommodate these principles to six courses, that being what is generally played in Spain: this same reason obliged me to publish them in Italian in 1792, adapted for the guitar with five strings, because at that time the one with six was not known in Italy. 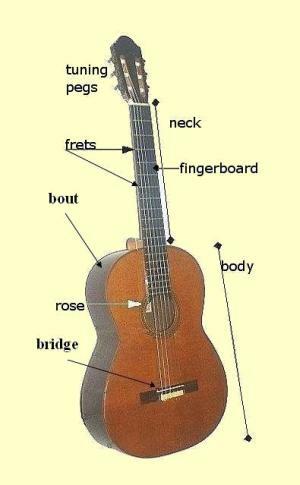 Besides the number of strings, other innovations in guitar construction occurred between the late 1700s and mid-1800s: the use of brass frets (instead of tie-gut) on the fingerboard, changes in the bridge, tuning gears (instead of the violin pegs that are still used on the Flamenco guitar, for example) and, finally, wider and more pronounced bouts. All of these produced, essentially, the modern classical guitar. The music conservatories in Naples go back to the mid-1500s when the Spanish rulers set up schools to train young musicians on the premises of four monasteries in the city: Santa Maria di Lorento, Pietà dei Turchini, Sant'Onofrio a Capuana, and I Poveri di Gesù Cristo. They not only trained young children in church music, but, eventually, became a 'feeder system' into the world of commercial music once that opened up in the early 1600s. Beginning in 1806, a decade of French rule in Naples drastically changed monastic life; religious orders, themselves, were closed and the monastic music schools were merged and moved to the premises of San Sebastiano, itself a church and ex-monastery. In 1826, that consolidated conservatory was moved to the present site, the ex-monastery of San Pietro a Maiella. Was guitar taught? Yes. In spite of Sebastian de Corrarubias Oroco's opinion (in 1611) that "the guitar is not worth more than a cowbell; it is so easy to play that there is not a single farm boy who is not a guitarist." [cited in The Word of Guitars, Christian Seguret, Charwell Book, Edison, NJ 1999], the guitar developed as a serious instrument during the Baroque and afterwards. In Naples, the existence of major music conservatories was the driving force behind the luthiers' craft. the making of stringed instruments, bowed such as the violin, as well as plucked or strummed such as mandolin and guitar. 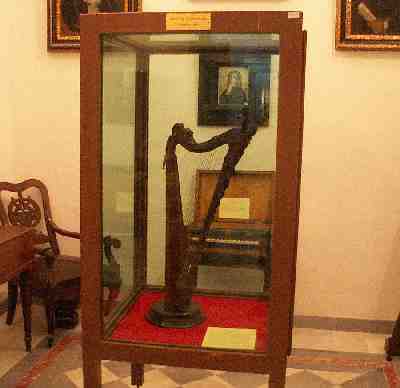 Besides G. Fabbricatore (mentioned above), other well-known luthiers of the 18th and 19th centuries in Naples were Vinaccia, Filano, Calace, and Alessandro Gagliano, an apprentice of Antonio Stradivarius in Cremona and largely responsible for bringing to Naples that part of the luthier's craft dedicated specifically to violin making. The popularity even abroad of such names as Calace for mandolins and guitars continued well into the 20th century. The current state of the luthier's craft in Naples is somewhat nebulous. It was greatly disrupted by the events of WW II and is still recovering; to the extent that it thrives at all, it is driven by the presence of new names as yet untested on the international market. Moretti (mentioned above) lived and worked in Spain and was the most influential of the early-l9th-century guitarists; he had a great influence on later composers for the instrument, such as Ferdinand Sor. Other well-known guitarists and composers for the instrument from Naples include Ferdinando Carulli (1770-1841), regarded as the leading Italian guitarist of his day. He lived and settled in Paris and enjoyed great success as a composer, performer and even instrument maker, helping to build the first 10-stringed instrument (four of which are "sympathetic"; that is, they vibrate to enrich the sound but are not plucked or strummed) of the kind made famous more recently by Narciso Yepes. Carulli was the author of the first complete classical guitar method and was a prolific composer for guitar, writing over 400 works for the instrument. 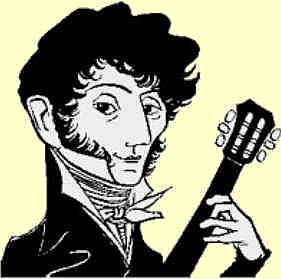 Another well-known guitarist from southern Italy was Mauro Giuliani (born in 1781 in Bari, died in Naples in 1829). He was originally a cellist, but took up the guitar and emigrated to the north, settling in Vienna, where he was billed as the "world's greatest guitarist." He eventually returned to Naples, where he worked for the patronage of the royal house of Naples. Giuliani was also a prolific composer for the guitar, turning out abut 200 compositions many of which remain standard items in the repertoire for the instrument. Among his most important works are the concertos for guitar and orchestra, opus 30, 36 and 70; a series of fantasies, opus 119-124, called the "Rossinianes," several sonatas for violin and guitar, a quintet, some duets for voice and guitar; he also wrote an instruction method. [Another] reason for going north was the political turmoil wreaked by Napoleon in Italy. It so destroyed social order that the conservatories were all but forced to close. This did not augur well for instrumental music, including the guitar: In the past ten years a frightful revolution has upset everything. When you consider that devastating wars and their usual, sad consequences have forcibly torn apart this nation, which in times of peace dreams serenely, and which requires that calm, that serene reverie, not only for its existence, but much more for its cultural and artistic activities, then you can hardly blame the Neapolitans! The German music writer who concocted that passage in 1805 was living in a typically German fantasy world about Italy. (He had probably just read Goethe's little ditty that idealizes Italy as the "land where lemons bloom.") First, he (the journalist, but I'm not so sure about Goethe, either) conflates and confuses "Italy" with the Kingdom of Naples and, second, there were no times of peace and serene dreams in Naples, even before Napoleon! The great Naples conservatories survived the horrible wars and plagues of the 1500s, 1600s and early 1700s, producing entire genres of music, such as the Comic Opera, and great musicians such as A. Scarlatti and Pergolesi, who lived and composed right through the demise of the Spanish empire (and, thus, the wrenching change of power in Naples) and the subsequent cataclysmic Wars of the Spanish Succession. Besides, the very idea that Italian art and culture flourish only in times of "serene reverie" would be news to Michelangelo and Leonardo! In any event, the "...devastating wars and their usual, sad consequences..." did not really apply to the Kingdom of Naples. In the face of the imminent French invasion, the Bourbon monarchy fled without a fight to Sicily in 1805. Naples, under French rule from 1806-14, was not marked by the Napoleonic turmoil of the rest of Europe; the social order was not destroyed; as a matter of fact, the kingdom was marked by progress in the arts and sciences. The Neapolitan conservatories were consolidated into a single institution—a step forward, not back. It may be, goes more plausible speculation, that the lack of an organized music publishing industry in the late 1700s in Naples drove composers away, or that the delicate acoustics of the guitar did not fare well in the large opera houses springing up all over Italy, or that the instrument could not compete with the overwhelming, all-popular sound of opera; thus, guitarists sought appreciation in the smaller spaces of northern chambers and drawing rooms. Currently, the San Pietro a Maiella music conservatory in Naples has two instructors for the classical guitar and provides a complete course of study for the instrument. There are about one-thousand students at the Naples conservatory (comparable to other conservatories in large Italian cities). 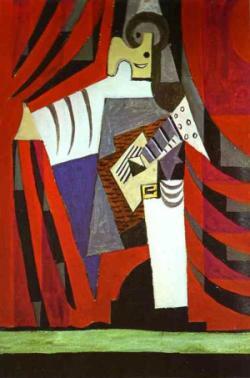 Of that number, a handful study classical guitar. That's not many, but it's a tough row to hoe. If you study violin and are not quite Joshua Bell or Itzhak Perlman, you'll still make a living as second fiddle—or even first—in some orchestra. But there ARE no second-guitar chairs in orchestras. There are not even first guitar chairs. If you decide to be a classical guitarist, you have one option: be a soloist; thus, you have to be not only very talented, but obsessed. Those who graduate with diplomas in guitar performance at the Naples conservatory must give a one-hour graduate recital that includes music by Bach, Giuliani, Paganini, Castelnuovo-Tedesco, and Villa-Lobos, as well as their own transcriptions of music originally written in tablature for forerunners of the modern guitar, such as the lute and vihuela. Other exams include performances of contemporary music and test the candidate's knowledge of the history of the instrument. 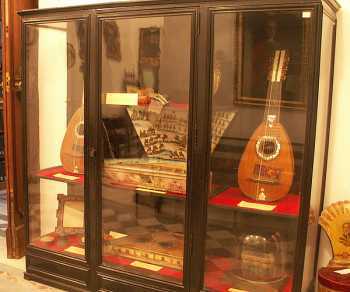 The library of the Naples conservatory has an extensive collection of early manuscripts of guitar music; the museum has a selection of historical instruments, including a few guitars, one spectacular 9-course, 18-string mandola (photo, above) and—I have to mention this, although it has nothing to do with the guitar—the only surviving harp made by none other than Stradivarius (image, below).